I posted a story in April about my father witnessing Igor Sikorsky’s first helicopter flight. https://kelleytjansson.com/2013/04/18/non-fiction-writing-getting-the-details-right/ My father was only a kid when he witnessed the historic flight. The problem was that he did not remember the date correctly. Fortunately, history recorded the event and I was able to confirm the date via normal research. What if the event that a memoir writer is trying to place on a timeline is not a historical event? That was exact the situation that I found myself in writing my own stories. About a year ago, I received feedback that my book was “too happy.” Although I am writing about a happy childhood, I decided that the reviewer (thanks Jay!) really had a point. What were the bad things that happened? It was easy to identify the worst one — the year Dad broke his leg. My father shattered his leg walking up the driveway on a snowy night in December sometime in the 1970s. We had been caught in a snowstorm and returned home after several inches of snow had already fallen. We parked the car close to the road and planned to walk up the ~100 ft driveway to the back of the house. It was easier to shovel the car out after snowstorms if it was closer to the road. The problem with the plan was that my sister did not want to get her feet wet. My father tried to carry her up the driveway. He slipped on ice beneath the snow and tossed my sister aside as he fell, breaking his leg with his own weight. The story really doesn’t end there, however. After a ride in the ambulance, his injury was not correctly diagnosed. Many months later he required surgery to repair the primary damage that had never been detected by the doctors who had originally treated him. Alas, many months of pain for my father, and a great deal of turmoil for the family in general. The hitch in the story is that I always blamed my sister for Dad’s horribly injury. If I had made the same complaint about not wanting to get my feet wet, then Mom and Dad surely would have insisted that I walk myself. My sister, on the other hand, always seemed to get special treatment. When I added the story to my book, Dad defended my sister and said that she was only a toddler and had “cute little saddle shoes on.” Really? That meant that the event happened much earlier than what I remember. In my memory, the event happened when I was 10, which meant that my sister would have been 8…a little too old for saddle shoes. How do I prove the timeline? At first I looked for dated pictures of Dad with his cast, but I couldn’t find one. I called the family doctor (a family friend), who gets the credit for getting my father to a competent orthopedic surgeon who eventually fixed his problems. Did he remember the date? Nope, he couldn’t help me. As a last resort, I called the hospital where my father had his surgery. When I asked if I could request medical records from the 1970s, the records department representative laughed at me. For a while, I was out of ideas. Then, I remembered that I ran next door in the snowstorm to get help from a neighbor on the night Dad broke his leg. The interesting fact about this memory is that the neighbors were new. We had lived amidst farmland, and the beautiful fields were mowed down to build houses. The neighbors had moved into a new house. Voila! I researched the date of the construction and it corresponded to 1977. I was ten years old, just as I had remembered. When I revealed the date to my father, he couldn’t refute it. Although, he was definitely a little irritated that the facts somewhat proved my original sentiments. Now, I’m certainly not a professional researcher, but I was pretty darn proud of myself to solve the mystery of the broken-leg timeline. Amazingly, I just stumbled over a second piece of information that confirmed the date — see drawing above! I apparently sketched my father in bed with his broken leg and had both signed and dated the picture! I found the drawing when I was going through boxes of childhood scrapbook items. It’s certainly not a very good sketch and very indicative of my lack of artistic talent (and artistic instruction!). “I knew you were no da Vinci,” said Dad when I sent the drawing to him a few days ago. I had always thought that it was pictures and documents that mostly drove memoir research. This story just goes to prove that there are many ways to fact-check information. Look in your boxes of keepsakes — there may be hidden items that could help with your memoir. 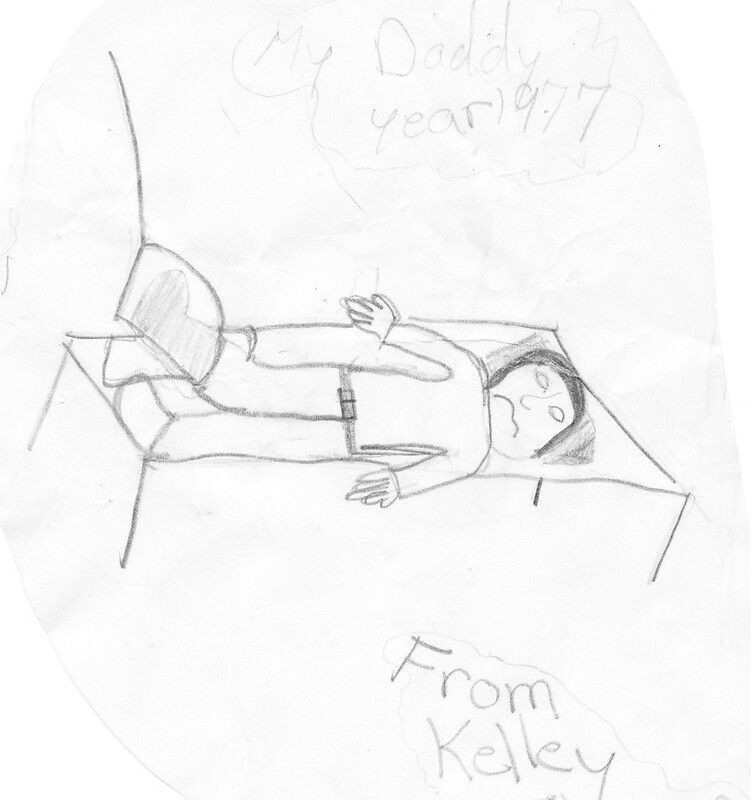 Excellent rendering of the perspective of your Dad’s bed, and what appears to be some sort of traction contraption — especially for a 10 year old! Also, the drawing of your Dad is well proportioned (and has all his fingers) and I’m sure the downturned mouth is absolutely accurate………… I disagree with your Dad’s assessment of your early artistic endeavors.